Welcome to the Internet home of Delikon, Specialists in flexible conduits & fittings. Delikon, a top Chinese manufacturer and exporter of electrical flexible conduits, liquid tight conduit, Heavy Series over braided flexible conduit, conduit fittings, and flexible hose for Industrial Automation, our business philosophy has always been based on quality products, innovative solutions, and service beyond our customers expectations. You will find a flexible solution from Delikon. Heavy Series Over Braided Flexible Conduit and Fittings for steel mill retrofit. Braided flexible conduits protect cables on machining, welding or heavy plant. LT Connectors offer excellent pull-off characteristics. Over Braided Flexible Conduit and Liquid Tight Conduit for protection of Offshore, Heavy industry and Petrochemical industry Electrical Wirings. Electromagnetic Shielding Over Braided Flexible Conduit. Braided Flexible Conduit and conduit fittings systems with emphasis on safety, security, and longevity. Industry heavy series over braided flexible conduit and connector is resistant to hot metal particles and suitable for metal smelting plant and CNC and EDM machine electric cables protection. Delikon Oil Resistant Coolant Resistant Over Braided Flexible Rubber Conduit and Metal Fittings protect Machine Tool Wire MTW against oil, coolant, and offer protection against Swarf or Chip. Delikon EMI Shielding Heavy Series Over Braided Flexible Conduit and Heavy Series Connector, Military Circular Connector Backshell protect automation cables in Body shop, Paint shop, and Final assembly. Rubber Covered Liquid Tight Conduit (YF-906) Hi-Lo Temp. Stainless Steel Flexible Conduit is used by various industries for OEM wiring conduit or armor cable and protective casing. Delikon heavy series over braided flexible conduit and fittings are specifically designed to protect Industry 4.0 power, control and instrumentation cable. Delikon Heavy Series Over Braided Flexible conduit and Fittings provide additional mechanical protection, hot metal splash resistance, as well as EMI shielding to automotive industry automation cables, metal industry and steel mill cables. Nowadays Delikon Liquid Tight Conduit is replacing pliable type in most applications: Interlocked liquid tight conduit is suitable for industry, pharmaceutical equipment and telecom. Interlocked liquid tight conduit has higher tensile strength. Delikon is the market leader in manufacturing heavy series over braided flexible conduit and fittings for carbon and stainless steels Continuous Casting Machine automation cable protection. With our long experience in supplying Heavy Series Over Braided Flexible Conduit as well as heavy series fittings, we can produce braided flexible conduits and fittings in the widest range available on the market, and with the best quality ever. Delikon Heavy Series Over Braided Flexible Conduit and Fittings protect rolling mills motor and Drives and Control system cables. Metallic flexible conduit systems with or without coverings provide Excellent protection against crushing and impact. Professional Electrical Wiring Protection Solutions. Delikon, TOP manufacturer of flexible conduits and fittings. Delikon Military Circular Connector Backshell,Conduit Adapter is designed to connect a cylindrical connector to flexible conduit. Together with Delikon EMI Shielding Heavy Series Over Braided Flexible Conduit and Heavy Series Connector, this over braided flexible conduit assembly provides reliable protection to the cables connecting to Military Connector and is widely used for the automotive, robotics, machine tool, steel mill and welding industries, as well as industry automation cable protection and commercial applications from heavy equipment to ECG monitoring cables. Delikon industry automation EMI Shielding Heavy Series Over Braided Flexible Conduit and Heavy Series Conduit Connector protect automotive and steel industry automation Ethernet cable, UTP unshielded twisted-pair cable, power and data cable. The heavy series metal connector clamp the over braiding tightly forming electrical contact around the entire periphery of the shield, providing a 360 degrees SHIELD termination. Braided-shield flexible conduit, SCREEN FLEX: Clean data transmission in a noisy environment is an ever-increasing requirement on today crowded factory floors. Variable-speed motors operating near data cables are a common occurrence - so is Radio Frequency interference. Delikon braided-shield flexible conduit provides excellent Radio Frequency, as well as mechanical protection to the wirings and cables, resulting in improved data transmission. Heavy series over braided interlocked metal Liquid tight Conduit and fittings provides excellent mechanical protection and EMC shielding to CNC cables. Delikon Over Braided Flexible Conduit & Fittings deliver reliable protections for industry automation cables. See our whole range of cable sheath Heavy Series Flexible Conduits to find the right solution for your demanding wiring projects. Delikon Heavy Series Over Braided Flexible Conduit & Flexible Conduit Fittings protect CNC EDM Machine Data and Power Cable and Fluid Line. Over Braided Flexible Conduit system specially designed for cables protections in steel mills, glass works and electric furnaces, resists hot metal splashes. Designed for heavy industrial environments, the Braided Flexible Conduit systems are overbraided with stainless steel for added protection, without restricting their flexibility. 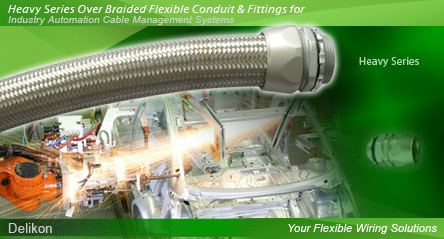 The braided flexible conduits offer high flexibility and high fatigue life. Heavy series over braided flexible conduit systems also protect cables from hot metal slag and provide standard EMI screening for the cables carried within the system. Most suitable for steel mill cable conduit. Delikon Heavy Series Over Braided Flexible Conduit and Fittings protect electrical and automation equipment cables, control systems, drive systems, and motors cables of steel making and iron making plant. Delikon EMI Shielding Over Braided Flexible Conduit and Fittings Systems help steel plant upgrading, equipment refurbishment and repair. Delikon Heavy Series Over Braided Flexible Conduit and Fittings are designed to protect CNC Control cables, Industry Automation PLC wirings, Servo and Spindle Motors cables, MPG Cables, and Drive Command Cables. Delikon Heavy Series Flexible Connectors simplify design, assembly and maintenance for CNC machining center and other modular machinery. Delikon Heavy Series Over Braided Flexible Conduit and Fittings protect ignition wiring and control wiring of industry Engine and Generator. Delikon stainless steel liquid tight connector and conduit resist corrosion and oxidation, for application in oil and gas industries. Delikon Liquid Tight Stainless Steel Conduit, Liquid Tight Conduit Stainless Steel Connector for Food, Pharmaceutical, Brewing, Dairy industries. Delikon manufactures stainless steel flexible conduit, water proof stainless steel flexible conduit, stainless steel liquid tight conduit, as well as stainless steel liquid tight connector for the paper and pulp industry cable protection. Heavy Series Conduit Fittings for heavy flexible conduit sheath, heavy series over braided flexible conduit systems: Straight Fittings, Angle Fittings, with G, Metric, ISO228-1, NPT or PG threads.Combined with this line of high specification conduit fittings, Delikon Heavy Series Over Braided Flexible Conduit systems offer a high level of protection for cables in the demanding environments. Delikon produces a whole range of MS Plug Adapters for connecting a military connector (MS Plug) or circular connector to a flexible conduit for industry automation cable management. In particular , the Over Braided Flexible Conduit with MS Adapter is most suitable for CNC machines wiring harness, industry control and automation cables protection. Over Braided Flexible Conduit, Fittings. Delikon Heavy Series Over Braided Flexible Conduit with MS Adapter for Servo Motor Cable. Heavy Series Over braided flexible metal conduit & fittings systems are ideal for protecting electrical and data cables in high temperature industrial applications with sparks, weld slag or hot swarf. Over braided flexible metal conduit is also suitable for EMC SHIELDING of cables. Delikon Over Braided Flexible Conduit has been designed to protect cables from EMI. Delikon EMI Shielding Heavy Series Over Braided Flexible Conduit and Heavy Series Connector protect FLNG and LNG facility automation cables. Heavy Series Over Braided Flexible Conduit and Braided Flexible Conduit Fittings for heavy industry automation electric cables protection. Cable protection metal hoses and fittings perfect all round protection for electrical cables. Liquid Tight Metallic Conduit IP67 rated is ideal for industry, railway signal and ship electric wirings. DELIKON quality metal liquid tight conduit fittings and liquid tight conduit for industry and commercial wiring. chemical resistance, waterproof connection, ease of installation, and reduced friction. Delikon Liquid Tight Conduit and fittings for railway or ship building cable management. Delikon Quality Large Diameter Liquid Tight Conduit and Fittings. Heavy Series Metal Fittings, Heavy Series Electrical Flexible Conduit for protecting industry control cables. In modernizing the main drives for the IRONMAKING AND STEELMAKING mills, Delikon Heavy Series Over Braided Flexible Conduit and Fittings protects automation cables. Stainless steel liquid tight conduit and stainless steel liquid tight conduit fititngs are best for corrosive environment such as chemical industry cable harness, water treatment plant wiring. Delikon Stainless Steel Liquid Tight Conduit is built to last. Delikon Liquid Tight Conduit & Connector for Port Equipment Cable Protection, providing reliable cable management solutions for all kinds of cargo handling equipments. Delikon Heavy Series Over Braided Flexible Conduit and Heavy Sheath Flexible Conduit Fittings protect CNC EDM Machine Data and Power Cable and Fluid Line. Delikon Over Braided Flexible Conduit and Fittings provide reliable protection to PLC cables. Delikon heavy series over braided flexible conduit and fittings for automation and process control wiring.